Vintage Fugs: Kupferberg far left, Sanders far right. As devoted students of rock history know, the most rewarding musical discoveries often are found in the esoteric footnotes rather than in the canned histories offered by hoary institutions like the Rock and Roll Hall of Fame, Rolling Stone and VH1. And as bizarre footnotes go, few are more worthy than the Fugs. Named for the cuss-word euphemism Norman Mailer was forced to use in the first edition of The Naked and the Dead, the most respectable accomplishments of the Fugs can be encapsulated thusly: Signing to Frank Sinatra’s Reprise Records, the ever-evolving and extremely hairy musical collective released four albums between 1968 and 1970 full of hippie rewrites of traditional folk tunes and typically literate, ’60s flower-power odes inspired by the like of William Blake and Algernon Swinburne. Think of a second-generation Beat musical answer to Allen Ginsberg. The primary constant and driving force of the band, Ed Sanders, first made his mark on the New York scene that nurtured Bob Dylan by running the Peace Eye Bookstore, the East Coast version of San Francisco’s famous City Lights. He became a respected social activist and lauded poet, winning both Guggenheim and National Endowment for the Arts fellowships; wrote the definitive accounts of both the Beat-era Lower East Side (Tales of Beatnik Glory) and the Manson clan (The Family) and eventually moved to Woodstock and took up inventing strange musical instruments like the Talking Tie and the Lisa Lyre, which involves light-activated switches and a reproduction of Da Vinci’s Mona Lisa. If you think you’ve never heard them, maybe you caught the Coen brothers’ 2008 film Burn After Reading, which featured the track “CIA Man.” Or maybe not. Bangs had loved the Fugs since his Kerouac-fueled days languishing in the early ’60s as a wild wanna-Beat in the stultifying strip-mall banality of El Cajon, California. In 1981, shortly before his death, he penned the liner notes to a Jem Records/PVC compilation album entitled The Fugs Greatest Hits Vol. I: Proto Punk, and that record was my entry point for loving this band. The 11 tunes still had the power to blow my young mind in 1982, 17 years after they were recorded. And damned if they aren’t just as potent now, 30 years on from that discovery. 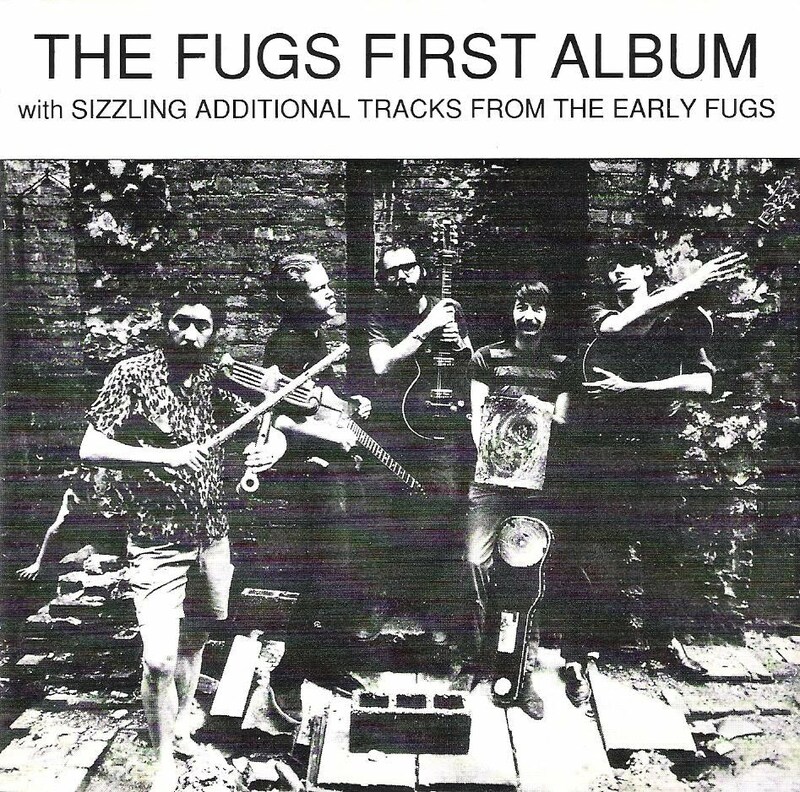 The story holds that one endless, drug- and booze-fueled jam session yielded all of the songs on The Fugs First Album (1965), much of The Fugs Second Album (1966) and Virgin Fugs (1967), and even some of the later compilation Fugs 4, Rounders Score (1975). These all originally were released on ESP-Disk, after the group was endorsed by Harry Smith of Folk Anthology fame. But for decades, the only Fugs music readily available and in print was that Jem/PVC cherry-picked compilation from those first four albums. This was a real sore point for Sanders, which I discovered when I made the mistake of asking him about it during an interview in the mid-’80s: The Fugs Greatest Hits Vol. I was not an authorized release, and the band never was paid for it. The early albums wouldn’t finally get official reissues until the mid-90s, via Fantasy. Now, you can even buy ’em on Amazon, and iTunes is selling a best-of round-up sampling from them (though it isn’t as good as that Jem/PVC set Sanders disdained). My chat with Sanders took place on the occasion of the first Fugs reunion since the ’60s, when the poet and bandleader regrouped with his veteran wingman and fellow original Fug Tuli Kupferberg and released a live set called Refuse to Be Burnt Out (1984). None of the other lunatics on the early Fugs records took part in that or subsequent reunions—missing in action were notable names such as Peter Stampfel and Steve Weber, better known for the Holy Modal Rounders—and the reconstituted group didn’t play many of the classic songs that Bangs or new-gen fans like me adored. One got the impression that Sanders considered them juvenile, and maybe even a bit offensive to more refined and mature tastes. Now’days, when Hustler features a pic of a naked woman being ground into hamburger on its cover, it’s easy to forget (or, if you weren’t around for the Sixties, wonder) how gestures like the lipfart scatology and yubba dubba doo boudoir bomp of these songs could be thought of as rallying warcries for a new and more humanistic social order. The idea being, of course, that if we all balled three times a day after each meal, and scarfed our righteous Owsley Pink Wedge, mass liberation was just around the corner… [But] don’t ever make the Seventies mistake of thinking they did this stuff just to get famous. They did it to EXPRESS THEMSELVES!